Despite being listed as one of the top ten most allergy-friendly chain restaurants in the 2015 AllergyEats Blog, Outback Steakhouse does not showcase food allergy information on their website anymore. So if you have food allergies, you will have to investigate the menu on your own a bit before going to eat there. Alternatively, you can access their online contact form ahead of time. In addition, you want to be proactive about asking questions and making requests during your actual dining experience. In the end, though, it may not be worth eating at Outback if you or a loved one has significant food allergies, especially if they cannot guarantee that a menu item is completely allergen-free. On the upside, though, Outback's website does offer dining tips regarding nutritious eating, as well as a lengthy Gluten-Free Menu. Victoria's Filet Mignon, 6 oz. Perfectly Grilled Salmon with fresh mixed veggies, 7 oz. Other tips on their nutritional website include a "No Rules, Just Right," policy where they recommend you ask for healthier options like vegetables over fries or placing the salad dressing on the side. You can also devise your own "dream meal," like wood-fired grilled shrimp, topped with barbecue sauce, and a plain sweet potato. 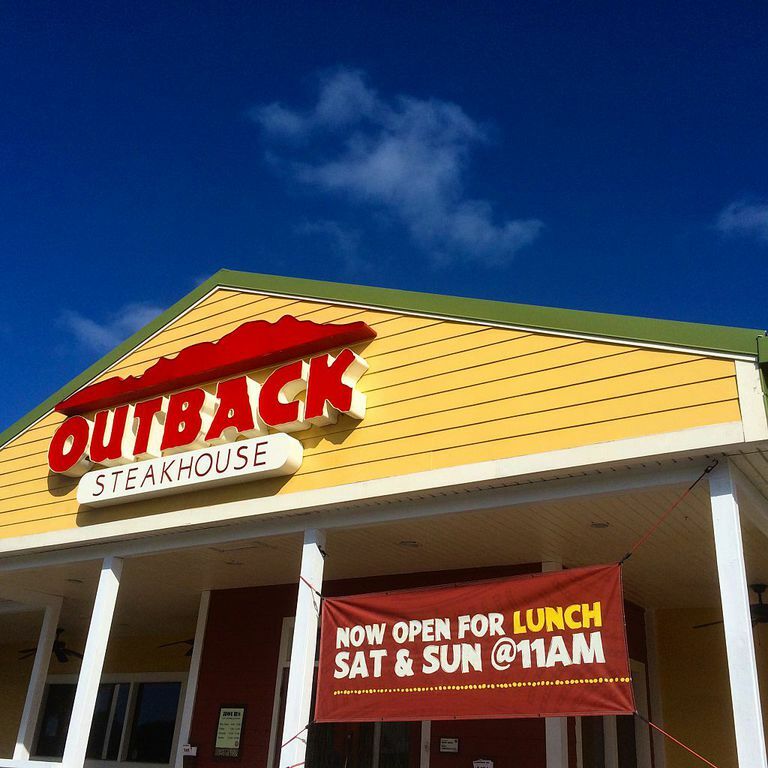 Outback also prides themselves on being a member of the National Restaurant Association Kids LiveWell program. They offer a couple healthy, kid-friendly menu options like the Joey Grilled Chicken with freshly steamed broccoli or the Joey Sirloin medallions, which your child can pair with steamed broccoli or fresh fruit. For drinks, besides soda, kids have the option of choosing milk or 100 percent apple or orange juice. The good news is that the gluten-free options offered at Outback Steakhouse are quite enticing and variable. For instance, some appealing dishes include their Alice Springs Chicken—a wood-fired grilled chicken breast topped with mushrooms, bacon, melted cheese, and honey mustard sauce—or their dessert, Chocolate Thunder From Down Under, which is an extra-large pecan brownie topped with vanilla ice cream, warm chocolate sauce, chocolate shavings, and whipped cream (yum). However, there is one caveat to keep in mind—the possibility of cross-contamination. Since Outback Steakhouse does not have gluten-free kitchens, there is the possibility that food may come into contact with a gluten-containing food. As an aside, on the website, Outback does note they educate all of their employees about being gluten-free, and they have a protocol implemented each time a gluten-free food item on the menu is ordered. Within this protocol are specifics on hand washing, changing gloves, and utilizing clean cooking utensils and equipment. Outback works with a third party to validate their gluten-free menu; however, their gluten-free menu items are not certified as gluten-free. In the end, even if you are proactive in your dining quest, it's important to keep in mind there are still knowledge gaps when it comes to restaurants workers fully understanding food allergies. In fact, according to one study, more than 10 percent of restaurant managers and staff believed that a person with a food allergy can safely consume a small amount of that food. With that, be mindful and safe of you or your loved one's allergy health. If your gut tells you to be wary of a particular restaurant or food item, choosing to stay home and prepare your own allergen-free meal is never a bad idea. Radke T et al. Food allergy knowledge and attitudes of restaurant managers and staff: An EHS-Net study. J Food Prot. 2016 Sep;79(9):1588-98.